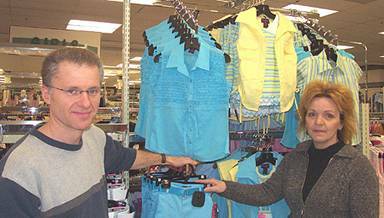 On Wednesday, March 30, 2005 , a new store will open at the Hanmer Valley Shopping Centre in Hanmer. With approximately 64,000 Grand Opening circulars being distributed to almost every household in the area, company officials expect to welcome a large crowd of bargain-conscious consumers wanting to be the first in line to take advantage of the hundreds of grand opening specials immediately after the ribbon-cutting ceremony. The mall doors will open up at 7:00 a.m. to accommodate the line up of early shoppers. In the photo above, Rod Groulx, Store Manager, and Julie Laquerre, Assistant Store Manager, put the finishing touches on the childrens’ wear section of the Hart Department Store. Hart Stores Inc., a “quiet giant” which has been steadily expanding for the past 45 years in Quebec and Eastern Canada , is taking a bold step into the Ontario market with the 30,000 square foot store at the Hanmer Valley Shopping Centre. The Hanmer site is only the second Ontario outlet of the 68-store chain. However, with a store opening up in Whitby on April 1 and another in Espanola in August, the Hart chain, which already operates out of Kirkland Lake , has quickly and successfully entered the “retail game” in Ontario . While the announcement of another department store in the City of Greater Sudbury may not on the surface be considered big news, the opening of the Hart Store in Valley East definitely has added significance for the area. For one thing, this is the first major retail chain to establish in one of the outlying communities since amalgamation. Previous expansion has been focused on the sites in the former city of Sudbury . When Michael Hart, President and CEO of the Montreal-based Hart Stores Inc., first examined potential sites in the Sudbury area, he was immediately impressed with the community of Valley East. For one thing, while the population of the Greater Sudbury Region has declined by 10% since 1971, the population in Valley East has actually increased in that same time by over 25%, and a close examination of the demographics verifies that this is a preferred community among young families. As people move into the City of Greater Sudbury from other larger metropolitan areas, many of them have been attracted to the quality of life of Valley East . Young people who have experienced the “big city life of Southern Ontario ” are seeking an escape from the congestion and traffic. They have discovered that Valley East contains all of the amenities of which they have been searching. Valley East is also the perfect setting for a Hart Department Store. Hart has solidified its share of what it considers to be a growing market and successfully coexists with its large big-box competition by differentiating its merchandising approach. Hart Stores provide local residents with the selection, quality and pricing of much larger box stores, with the added benefit of personal service that one would only expect from much smaller establishments. It is the best of both worlds, and gives Valley East residents the finishing touch they were looking for. A community of 25,000 people, situated about 20 minutes from large retail centers, with a growing population base of people in search of a small town atmosphere with big city convenience, is the ideal location for a Hart Department Store. Even more important to Valley East is that the new Hart Department Store has opened the “flood-gates” for even more retail expansion in the community. Over the next several months, other similar-sized retail outlets are expected to announce that they will be establishing in Valley East as well. Once local residents realize that this is a community where they can have it all, the economic spin-off will be tremendous. Shoppers today are getting tired of the “big city” congestion that comes with most major retail development complexes. It is nice at the beginning, but the novelty soon wears off. The fact that Hart Stores Inc. chose Valley East as the place to establish a foot-hold in Ontario says a lot about the confidence this chain has in the community. Visitors to the store will soon realize that the day has now come when communities the size of Valley East can have the same retail choices as much larger centers and still maintain that “personal touch” which is so very important to a healthy quality of life. All eyes in the City of Greater Sudbury will be on Valley East during the next several months in anticipation of an economic “boom” in retail development to meet the growing demand among local residents for a health mix of selection, convenience and customer service that will allow for a quality of life that until now was unobtainable.